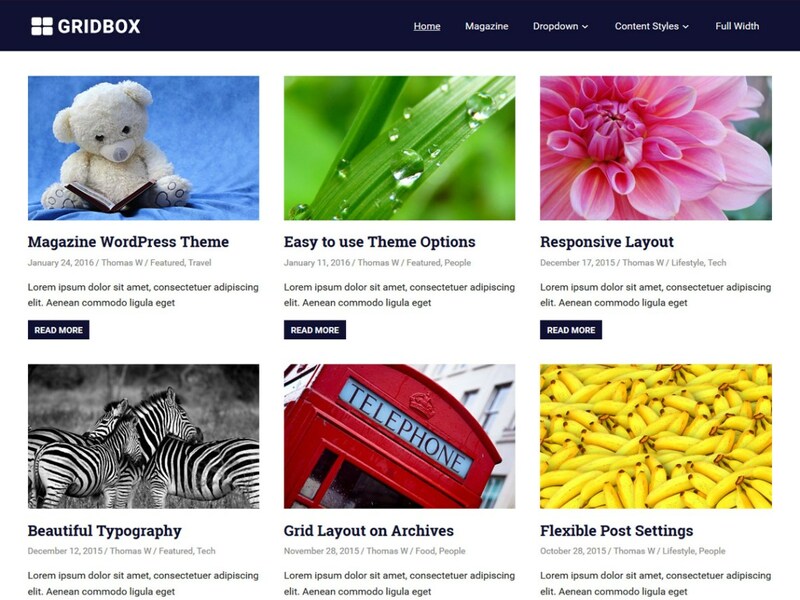 Gridbox is a popular 3-column grid based WordPress theme launched by ThemeZee. The theme is specially geared towards publications. With it, you can create a stunning magazine style homepage within couples of minutes. You can also use this flexible WordPress design for creating blogs and portfolio websites. The theme works outstandingly and doesn’t require complex setups. Getting your own grid-based WordPress website is now a quick and easy affair. This creative grid style theme is packed with fresh-faced layouts and templates. You will be using a plethora of widgets, customization options, and settings to get a dreamy design from scratch. The theme ranks well for an impressive speed and performance scores. Gridbox WordPress theme gets you a fully-responsive website. So, you don’t need to worry about how your website will appear and function on mobile devices, laptops, tablets, and desktops. Theme settings are very easy to use for quick customizations to suit your expectations and preferences. The code of Gridbox WordPress theme is structured according to SEO guidelines. The design comes with clean HTML5 and CSS3, so optimized for excellent loading speed. It is compatible to work in all modern web browsers without a bit of difficulty. Gridbox gives you flexibility with your website with its range of custom widgets. Though the theme is fully localized, you can translate it into your native or preferred language without any hassle. Excellent customer care facility supports this well-documented WordPress theme. Try Gridbox today, and see the difference! Contribute to gridbox development by creating an account on GitHub. This entry was posted in Magazine Wordpress Themes and tagged in best wordpress themes, creative wordpress theme, free wordpress design, free wordpress themes, Grid, gridbox wordpress theme, Three Columns.